The Wilmington Small Exterior Wall Sconce offers heavy-duty, industrial style. Made of weather-resistant cast aluminum and coated with a durable rust finish, these fixtures withstand harsh elements, year in year out. The clear seeded-glass shade and stamped back plate add authentic style to your porch, patio or gazebo. 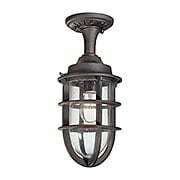 The Wilmington Large Exterior Wall Sconce offers heavy-duty, industrial style. Made of weather-resistant cast aluminum and coated with a durable rust finish, these fixtures withstand harsh elements, year in year out. The clear seeded-glass shade and stamped back plate add authentic style to your porch, patio or gazebo. 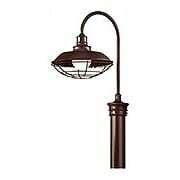 The Allegheny Medium Entry Light is reminiscent of early 20th-century, industrial style. 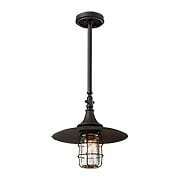 Substantial and sturdy, these fixtures are made of hand-forged iron, and feature historic, clear jar glass, a rich finish, and thick protective cage. Stone houses and urban lofts are perfect backdrops for these exterior classics. 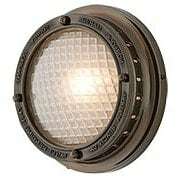 The Allegheny Large Entry Light is reminiscent of early 20th-century, industrial style. Substantial and sturdy, these fixtures are made of hand-forged iron, and feature historic, clear jar glass, a rich finish, and thick protective cage. Stone houses and urban lofts are perfect backdrops for these exterior classics. Inspired by a porthole window, this nautical-style Norfolk Small Exterior Wall or Ceiling Light is suited for use indoors and out, on walls or ceilings. 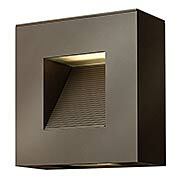 The solid-brass frame features the manufacture’s stamp and encases a frosted, prismatic-glass shade. And the marine-bronze finish adds the perfect finishing touch. Use the larger sizes alone to light an entryway, or group the smaller sizes to line a hallway or covered walkway. 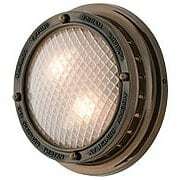 Inspired by a porthole window, this nautical-style Norfolk Medium Exterior Wall or Ceiling Light is suited for use indoors and out, on walls or ceilings. The solid-brass frame features the manufacture’s stamp and encases a frosted, prismatic-glass shade. And the marine-bronze finish adds the perfect finishing touch. 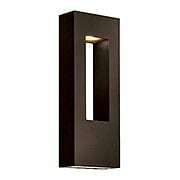 Use the larger sizes alone to light an entryway, or group the smaller sizes to line a hallway or covered walkway. Inspired by a porthole window, this nautical-style Norfolk Large Exterior Wall or Ceiling Light is suited for use indoors and out, on walls or ceilings. The solid-brass frame features the manufacture’s stamp and encases a frosted, prismatic-glass shade. And the marine-bronze finish adds the perfect finishing touch. Use the larger sizes alone to light an entryway, or group the smaller sizes to line a hallway or covered walkway. 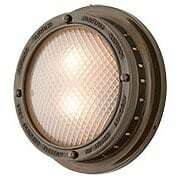 The Circa-1910 8-Inch Exterior Wall Sconce epitomizes industrial chic. This vintage style features a cast-iron back plate proudly stamped with the manufacturer’s label, hand-forged iron accents, and a practical bulb-protecting cage. 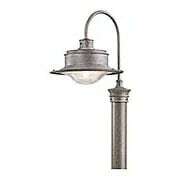 Display this fixture on the exterior of your late 19th-century prairie home or California bungalow. 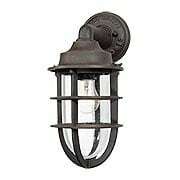 The Circa-1910 12-Inch Exterior Wall Sconce epitomizes industrial chic. This vintage style features a cast-iron back plate proudly stamped with the manufacturer’s label, hand-forged iron accents, and a practical bulb-protecting cage. 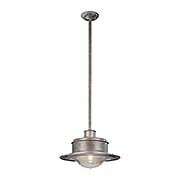 Display this fixture on the exterior of your late 19th-century prairie home or California bungalow. The Circa-1910 Exterior Pendant epitomizes industrial chic. This vintage style features a cast-iron back plate proudly stamped with the manufacturer’s label, hand-forged iron accents, and a practical bulb-protecting cage. 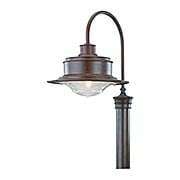 Display this fixture on the exterior of your late 19th-century prairie home or California bungalow. Inspired by factory industrial lighting of the 1920s and 30s, the South Street Small Exterior Wall Sconce brings bold style to your decor. 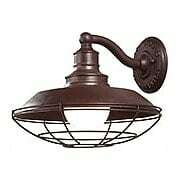 Made of heavy-duty cast iron, this vintage-style fixture is as durable as they come. The prismatic glass shade casts a stylish and brightly diffused light, and the canopy is proudly stamped with the manufacturer's label, lending an authentic look. Suited for displaying on the exterior of your late 19th-century prairie home or California bungalow. Inspired by factory industrial lighting of the 1920s and 30s, the South Street Medium Exterior Wall Sconce brings bold style to your decor. Made of heavy-duty cast iron, this vintage-style fixture is as durable as they come. The prismatic glass shade casts a stylish and brightly diffused light, and the canopy is proudly stamped with the manufacturer's label, lending an authentic look. Suited for displaying on the exterior of your late 19th-century prairie home or California bungalow. Inspired by factory industrial lighting of the 1920s and 30s, the South Street Large Exterior Wall Sconce brings bold style to your decor. 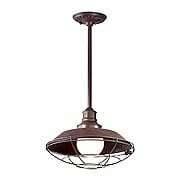 Made of heavy-duty cast iron, this vintage-style fixture is as durable as they come. The prismatic glass shade casts a stylish and brightly diffused light, and the canopy is proudly stamped with the manufacturer's label, lending an authentic look. Suited for displaying on the exterior of your late 19th-century prairie home or California bungalow. Inspired by factory industrial lighting of the 1920s and 30s, the South Street Mini Exterior Pendant brings bold style to your decor. 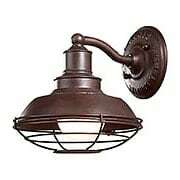 Made of heavy-duty cast iron, this vintage-style fixture is as durable as they come. The prismatic glass shade casts a stylish and brightly diffused light, and the canopy is proudly stamped with the manufacturer's label, lending an authentic look. Suited for displaying on the exterior of your late 19th-century prairie home or California bungalow. Inspired by factory industrial lighting of the 1920s and 30s, the South Street Medium Exterior Pendant brings bold style to your decor. 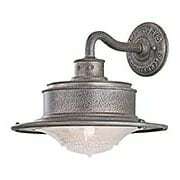 Made of heavy-duty cast iron, this vintage-style fixture is as durable as they come. The prismatic glass shade casts a stylish and brightly diffused light, and the canopy is proudly stamped with the manufacturer's label, lending an authentic look. Suited for displaying on the exterior of your late 19th-century prairie home or California bungalow. Inspired by factory industrial lighting of the 1920s and 30s, the South Street Medium Exterior Post Light brings bold style to your decor. Made of heavy-duty cast iron, this vintage-style fixture is as durable as they come. The prismatic glass shade casts a stylish and brightly diffused light, and the canopy is proudly stamped with the manufacturer's label, lending an authentic look. Suited for displaying on the exterior of your late 19th-century prairie home or California bungalow. Inspired by factory industrial lighting of the 1920s and 30s, the South Street Large Exterior Post Light brings bold style to your decor. 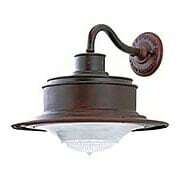 Made of heavy-duty cast iron, this vintage-style fixture is as durable as they come. The prismatic glass shade casts a stylish and brightly diffused light, and the canopy is proudly stamped with the manufacturer's label, lending an authentic look. Suited for displaying on the exterior of your late 19th-century prairie home or California bungalow. 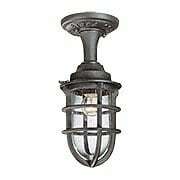 The Wilmington Small Exterior Flush-Mount Ceiling Light offers heavy-duty, industrial style. Made of weather-resistant cast aluminum and coated with a durable rust finish, these fixtures withstand harsh elements, year in year out. The clear seeded-glass shade and stamped back plate add authentic style to your porch, patio or gazebo. 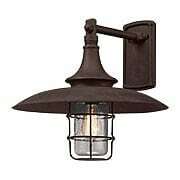 The Wilmington Large Exterior Flush-Mount Ceiling Light offers heavy-duty, industrial style. Made of weather-resistant cast aluminum and coated with a durable rust finish, these fixtures withstand harsh elements, year in year out. The clear seeded-glass shade and stamped back plate add authentic style to your porch, patio or gazebo. 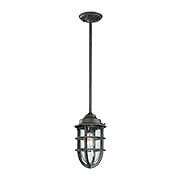 The Wilmington collection offers an array of heavy-duty, exterior sconces, wall mounts, and pendants. Made of weather-resistant cast aluminum and coated with a durable rust finish, these fixtures withstand harsh elements, year in year out. 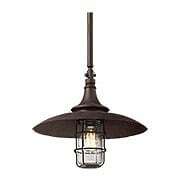 The clear seeded-glass shade and stamped ceiling plate add authentic industrial-style to your porch, patio or gazebo. Understated style and a subtle light source make the Atlantis Side-Mounted Sconce with Two Lights a must for Modern exteriors. Artfully composed of extruded aluminum with a durable powder coated finish, each piece is elegant and weather tight. Features two halogen lights (center and bottom). Understated style and a subtle light source make the Atlantis Large Side-Mounted Sconce with Two Lights a must for Modern exteriors. Artfully composed of extruded aluminum with a durable powder coated finish, each piece is elegant and weather tight. Features two halogen lights (center and bottom). Understated style and a subtle light source make the Atlantis collection a must for Modern exteriors. Artfully composed of extruded aluminum with a durable powder coated finish, each piece is elegant and weather tight. Features an etched glass panel on the bottom for illumination. A minimal silhouette and subtle light source make the Luna 9-Inch ADA Exterior Wall Sconce a clear choice for modern homes. 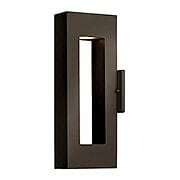 This low-profile fixture is crafted of weather-resistant aluminum, and features an etched glass diffuser and your choice of two popular finishes. Ideal for enhancing landscape elements like flower beds, shrubbery, and borders while illuminating pathways for added style and safety. 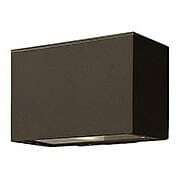 Available in LED and incandescent lighting options. Understated style and a subtle light source make the Atlantis Rear-Mounted Sconce with Two Lights a must for Modern exteriors. 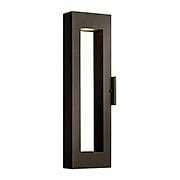 Artfully composed of extruded aluminum with a durable powder coated finish, each piece is elegant and weather tight. Features two halogen lights (center and bottom).